There’s something reassuring about a coffee shop in a basement. It feels safe, withdrawn, away from the care and noise of the world. You descend a flight of stairs - watch your step - and enter a world apart. It’s a place to relax, to hunker down, to hide. You can gaze up through the windows and see anonymous legs stride by, hurrying to somewhere you don’t need to worry about. It’s a special experience. There seems to be a pattern of coffee shops in Edinburgh choosing to situate themselves in basements. Maybe it’s a rent thing, maybe it’s an ambience thing, or maybe they’ve all colluded to force us to exercise by climbing stairs (possibly all three). 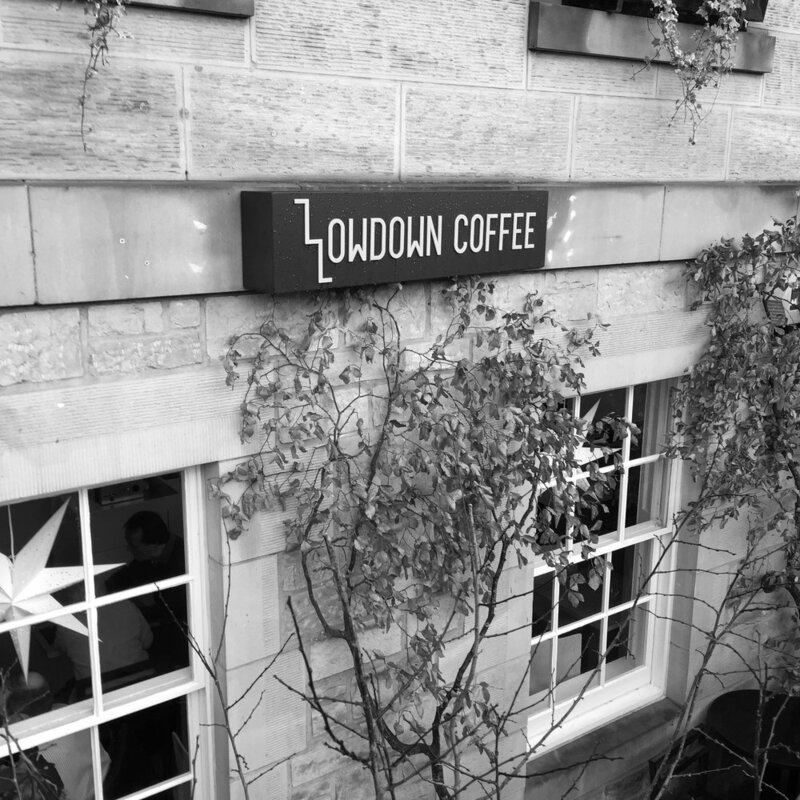 Lowdown is one of the newer entrants to the Edinburgh coffee scene, only opening at the beginning of last year. Located on George Street, it is a Scandinavian-inspired cafe that offers a rotating coffee lineup from some of Europe’s most esteemed roasters. In the past they’ve featured Assembly Coffee from London and Berlin’s Five Elephant, for example. From the street, and with the hustle and bustle of George Street all about, it can be quite hard to spot. The first inkling that something is afoot is the sandwich board pointing to a flight of stairs, and a small sign on the wall above a couple of windows. Down into the courtyard where, if it were summer, people would surely be enjoying the sunshine until it rained again ten minutes later because this is Scotland, who are we kidding. If it weren’t for the small counter directly in front as you enter, you could be forgiven for thinking you’d wandered into somebody’s (extremely stylish) kitchen. There is no traditional bar, with espresso machine mounted atop and barista standing behind, awaiting your order. At Lowdown, the bar is reversed and set against the back wall, so the barista has to turn away to make drinks. This allows the customer to watch the show and follow the barista’s every movement (should they be so inclined). The glass pastry case is suspended in the middle of the very small counter, with water carafes on one side and the till on the other. Table service is the order of the day - this, it seems, is becoming more popular, and only accentuates the feeling of being a guest in someone’s home. Theirs is a minimalist aesthetic, emphasised by the clean lines of the cabinetry and tastefully spare decoration, with only a few pot plants and one large painting on the far wall. The bar area (kitchen counter?) is dominated by the handsomely squat form of a two-group Slayer espresso machine, with a Mahlkönig EK43 grinder for company. I’m a big fan of Slayer, having used one extensively as a barista back in my previous life (I’m ambivalent towards the band Slayer). I always found the Slayer to produce exceptional espresso, although I will say that I’m glad I wasn’t the person tasked with fixing it when it broke. The espresso offering on the day I visited was Colonna Coffee’s Guatemala Bella Elizabeth, and for filter they had Koppi’s Costa Rica Barrantes. The Costa Rica was delicious, sweet and well balanced with notes of earl grey tea and a dry, blackcurrant finish. The Guatemala I had as a flat white, and it too was extremely pleasant, a good thrust of toasted marshmallow with just the slightest hint of licourice at the end. There are also, soups, sandwiches and cakes on offer, as well as teas and hot chocolate for those less coffee-inclined. The coffees were prepared with care, attention, and no little skill, by baristas who clearly took pride in their work. I could happily have idled away many hours in Lowdown, sipping coffee and watching the world go by (the bottom half of it anyway). It is a sleek, sophisticated hideaway, a place to find shelter from the crowds and linger over a quality coffee. It doesn’t get much better than that.